....I recieved a layout kit from Zina Wright this week ...Zina for the first time offered kits to those of us who couldnt make it to the class.....can you see me smiling?? Oh Mardi, i dont think i know what to say, lol, Glad Briony's back OK!, Get those seedling in! lol, Get Back on that wagon ! I need a sleep after reading all that! Ohh thats pretty cool about the classes too, i relly should start doing some of them! Well i do nned some sleep now i will be off! Hiya Mardi - sounds like its been a busy few days for you. Hope Briony enjoyed her camp, bet she has heaps to share bout it. Can't wait to see what you come up with for the kit by Zina, would be cool to play with a kit she put together. Have they decided on the FK elite team, how exciting and cannot wait to hear who has been chosen. Exhausted by u Mardi, all the running around u do. Told ya Briony would be fine! I bet those Zina packs are divine to play with have fun! Whew! You are so busy! Do you meet yourself coming and going? lol I need to sit down and have a rest just reading everything. Get those seedlings in! I am so glad Briony is back safe and sound. Take a nice long bubble bath and relax a bit. Sounds like you need it. GORGEOUS! Design Mardi... then again.. your talent always amazes me! Hugs from across the pond! Girl, you wore me out!! Makes sense to me mate!! Keep watering those seedlings..they'll be right. Glad Briony FINALLY made it home..what an experience for everyone involved. I am also waiting to hear who the new FK Elite team is..frustrating isn't it? 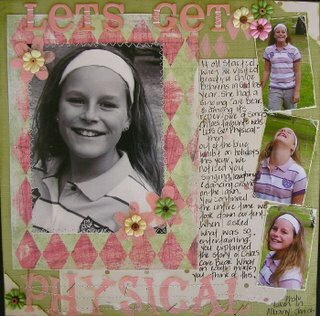 How do you fit "scrapbooking" into your busy schedule?! I remember the Physical layout, from when you originally posted it on Memory Bugs - that was AGES ago! Such a cute story. I've missed you while I've been away! Busy, busy, busy! And, yes, the ET has been announced. Erica Glover, Jaunita Walker, Suz Doyle and Sarah van Wijck. Cool group! Glad Briony's back home safe and sound. I can't believe how much you have packed into a weekend! Im sure that weekends are supposed to be for relaxing? Does anyone ever get a chance too lol?!!!! Mardi I am so very tired now LOL !! you are always so busy doing heaps of different things. Love the layout in the mag Mardi. Looked great. Hope you get some time to do you stuff.